How do heat exchangers work and what are their applications? Heat exchangers are devices that some machines and plants use in order to transfer heat from one medium to another. They are widely spread, as they are a part of a great variety of household appliances. Air conditioners, stoves or outdoor wood boilers all have this device as part of their built. Also, a great variety of plants and oil refineries use heat exchangers in their day-to-day processes. One of the best-known applications for heat exchangers is its use in household appliances. Most heat exchangers are essential components of stoves, refrigerators and air conditioning systems. Also, they are used in radiant heating systems and solar heating systems. They are efficient power savers and, with proper installation, they will last for years without any repairs or replacements. Brazed plate heat exchangers are small devices made out of brazed plates placed at a predetermined distance one from the other. The liquid (cooling liquid or hot liquid depending on its purpose) circulates between the plates and exchanges heat with the exterior environment. Brazed plate heat exchanger are used not only for controlling the liquid Freon in your refrigerator's cooling system, but also for wood stoves and snow melting. An interesting application of heat exchangers is the beer and wort chilling heat exchanger. This is extraordinarily useful for those who intend to brew their own bear at home. In the brewing process, betting the wort within the optimal temperature limits is vital. If the wort is too hot, or too cold the beer will lose its flavor, become too bitter, or it will have too much alcohol in it. Also, brazed plate heat exchangers are suitable for swimming pool heaters and heat recovery systems. If you were ever curios where all the geothermal heating in your hot tub comes from, heat exchangers would be the answer. Water to air heat exchangers has been used for other appliances such as outdoor wood boilers and wood stoves. Those heat exchangers transport hot water through copper coils and aluminum fins. Outdoor wood boilers used forced air for their functioning. In order to attach a heat exchanger to a forced air heating or forced air cooling system, you will need to make sure it is properly sealed. If the sealing is faulty, the heat exchanger will have to work harder, and it will break sooner. The size of the device is particularly beneficial. When deciding on what size the heat exchanger should be, measure the plenum above the boiler coil then buy the next size smaller of the resulting measurement. Heat exchangers are also used in industrial applications. In almost 100 percent of the cases, the heat exchangers found in a plant will be shell and tube heat exchangers. Those pieces of equipment consist of a series of tubes that allow the liquid to circulate without ever mixing. 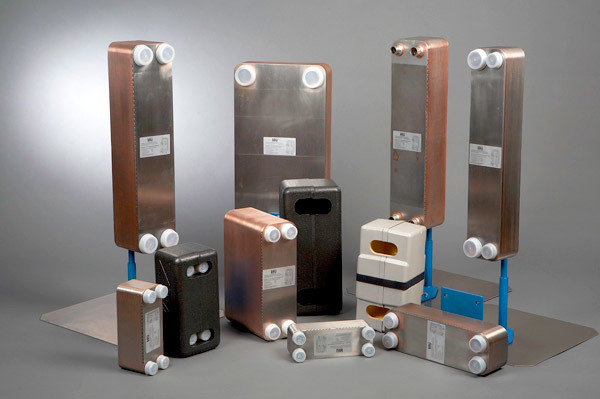 These heat exchangers are used for high pressure applications, such as oil coolers. Because of this aspect, they are nowadays exclusively used in plants. All in all, water to air heat exchangers are an essential component of many machines and plants at the present time. Whether you use a snow melting system that transfers heat to your driveway or you use your air conditioning or you just what to save some money on energy and decide to buy an outdoor wood boiler, you will use heat exchangers. Be careful with the install of those devices. It is extremely valuable to install them correctly; otherwise, the entire machine can break down. To avoid any problems, hire a professional in order to get them set up and ready to perform as expected. Seeing that just about every man or woman possesses one or more automobile, it could be testified that the vehicle radiator is among the most popular gadget through the heat exchangers recognized by an average person. This sort of heat trader is easy to describe. By taking benefit of the natural air movement which moves through it as the car is moving on a street, the radiator is going to take out most of the extra heat eliminated by the liquid that cools down the engine. In the contemporary times, the heat exchangers get their fit inside practically any of the systems that people utilize on a regular basis. They are often found in huge facilities and several other areas. They go from large and complex to the minor and most straightforward gadgets available to choose from. A different frequent type of heat exchangers stands out as the parallel-flow transmitter. This kind of unit requires a couple of fluids entering the exchanger, moving in parallel from one another to complete the heat exchange process. Other types of widespread heat exchangers in the everyday life are the refrigerator and the air conditioners, which are certainly just about the most utilized ones during both summer and winter. Although the freezer can simply cool of or freeze, the HVACs can achieve both cool down as well as heat up the surroundings, turning it into an outstanding tool over the summer and winter too. To sum up, the heat exchangers’ function is to transfer the temperature from one state to a different one. This is often primarily affected by the speed of circulation that the liquids or air have and by the total surface amongst the liquids or airs. The fluid-air heat exchangers rely a great deal on their variety and process they use to transmute the temperature from one state to another as a way to acquire the needed consequence.